The purpose of the steering group is to support the delivery of the Global Health Research Group award by providing oversight, challenges, advice and support to the project team. 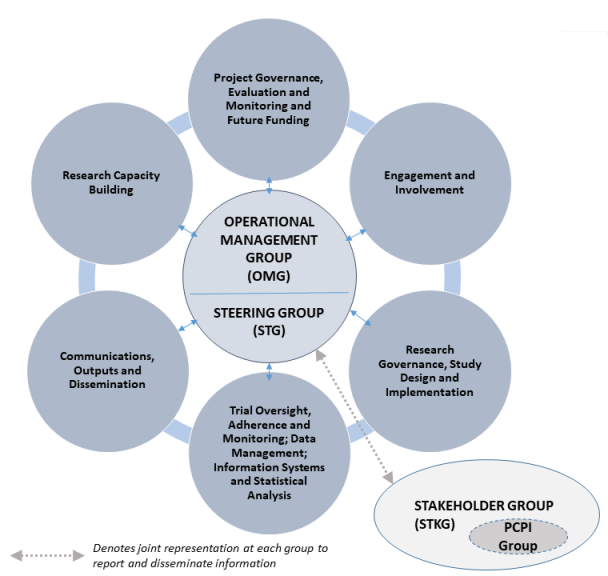 The purpose of the Operational Management Group is to support the delivery of the Global Health Research Group award by ensuring effective operational management of the project. The purpose of the Stakeholder Group is to support the delivery of the Global Health Research Group award by ensuring effective stakeholder engagement and involvement with the project. The programme has six workstreams each of which leads specific bundles of work. The workstreams input into the Operational Management Group and Steering Group. This maintains strong collaboration and effective communication.